Nancy Sharpe flanked by fellow Arapahoe County Commissioners Jeff Baker and Kathleen Conti. Denise and Mike Rose on July 19 in 99-degree heat to show their support for Sharpe’s run for a third and final (she is term-limited) term as Arapahoe County Commissioner. Before being elected to the Arapahoe County Commission, Sharpe served Greenwood Village on its city council from 1997 to 2002 and as its mayor from 2002 to 2011. In attendance were seven current and former GV city council members whose council service dates from 1993 through today, a span of 25 years. That is the type of loyalty Nancy Sharpe engenders. Among the current and former elected officials present were fellow Arapahoe County Commissioners Jeff Baker and Kathleen Conti, Treasurer Sue Sandstrom, GV Mayor Ron Rakowsky, former commissioner Nancy Doty, and from GV city council Denise Rose, Karen Blilie, Candy Figa, Bette Todd and Jerry Presley. Local Republican worker bees who organize a myriad of fundraisers for multiple candidates, provide the refreshments, show up and also donate their money to the candidates, but stay in the background and are seldom mentioned, were there in force, because of their respect and affection for Nancy Sharpe. Among them, Andi Allott, Carol Waller, Bob Miles, Mary Wenke, Cindy Webb, Evie Ashmore, Jacque Ponder, Jane Ames, Pam Cirbo, Jewell Hargrave and James Hoffman. Arapahoe County Sheriff Dave Walcher is one of Nancy Sharpe’s greatest supporters. The Colorado Women’s Alliance is pleased to announce its endorsement of Nancy Sharpe for re-election to her District 2 seat on the Board of County Commissioners in Arapahoe County. Weighing the rising cost of housing, public safety issues, and impact on roads and congestion in all land use decisions. 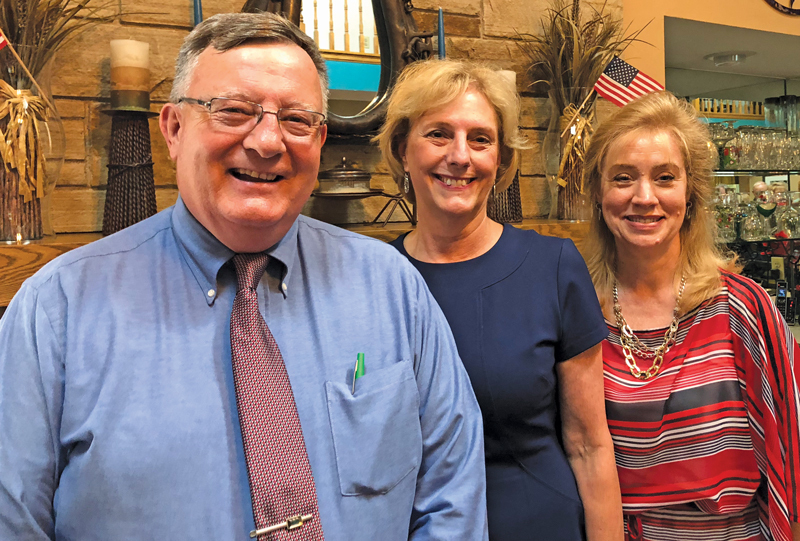 Nancy Sharpe is a well-known collaborator and voice of common sense and reason and she is often sought out to serve on committees that seek to solve difficult problems in the region. We believe that the people of Arapahoe County will benefit from having her on their side for four more years. Greenwood Village, CO -- County Commissioner Nancy Sharpe is running for re-election to a third term as Arapahoe County Commissioner, District 2. Nancy wants to continue focusing on improving the lives of Arapahoe County residents. While on the Commission, Nancy has worked to secure appropriate funding for critical roadway expansions and improvements such as I-25/Arapahoe Road, park enhancements, creation of new trails and open space, and allocating citizen tax dollars wisely and conservatively. Nancy helped accomplish this while maintaining a strong focus on her two passions: ensuring public safety, especially the safety of children and the elderly, and maintaining a strong economy. Nancy has extensive community leadership involvement beyond County Commissioner including Mayor of Greenwood Village, Chair of Metro Mayors Caucus, Chair of the Denver Regional Council of Governments, Chair of the Metro Area County Commissioners, and Board of Trustees for Denver South Economic Development Partnership. Over the last seven years, she served several years as Chair of Arapahoe County Board of County Commissioners. Nancy also worked in the private sector as an executive bringing her critical business experience to work for Arapahoe County citizens. Nancy has been an Arapahoe County resident for nearly 40 years raising her family here with her husband George. Nancy credits her father, a career Army officer, for installing the love for her Country and her commitment to service of others. Nancy wants to continue this service as County Commissioner for four more years. Additional information about Nancy and her campaign can be found at www.electnancysharpe.com. LITTLETON, CO --- The future of biking and walking in and around Arapahoe County is looking bright. The Arapahoe County Board of County Commissioners voted unanimously Oct. 17 to adopt the Bicycle and Pedestrian Master Plan, which includes findings, policy recommendations, design guide and a proposed network of on-street and trail facilities and projects needed to complete the network. The plan was previously adopted by the Arapahoe County Planning Commission Oct. 3 and will become part of the Arapahoe County Comprehensive Master Plan through the year 2035. The Bicycle and Pedestrian Master Plan is a joint effort of the County’s Open Spaces and Public Works and Development’s Transportation Division and has been in development since May 2016. It includes a vision and goals for biking and walking in and around the County and provides a framework for creating a comprehensive on-street bicycle and trail network that safely connects neighborhoods and destinations and encourages walking and bicycling, as well as other forms of use including equestrians, for travel and recreation. The plan covers both the incorporated and unincorporated portions of the County and was developed in close coordination with all local municipalities. Public feedback also was sought and implemented during the process through public meetings, an online survey and engagement through social media. The plan also will help guide future development of bike and pedestrian facilities through a variety of on-street and trail improvements outlined in the proposed network. On-street bicycle treatments include bike routes, bike lanes, multipurpose paths and new options, such as buffered bike lanes and protected bikeways. Off-street trail updates include new trail connections, links to the on-street bike network, future trailheads and underpasses and widening of some regional trails that experience heavy use by bicyclists and pedestrians. The Bicycle and Pedestrian Master Plan is a long-term vision that identifies infrastructure projects to create a low-stress network that will be completed 20 – 30 years in the future. Based on the goals of the plan, projects that will have the biggest impact on connecting the network and users have been prioritized. The completion of the network will occur over time as resources become available. LITTLETON, CO --- Arapahoe County has joined the Colorado Department of Transportation’s Moving Towards Zero Deaths Initiative to reduce traffic fatalities in Colorado. The Board of County Commissioners voted to become a partner on Sept. 19. Arapahoe County is the first County in Colorado to adopt the Moving Toward Zero Deaths initiative, joining other statewide partners in their pledge to focus on programs that help decrease fatalities, serious injuries and crashes. The Arapahoe County Sheriff’s Office and Public Works and Development Department will partner to support the initiative in areas including aging road users, bicyclists and pedestrians, impaired driving, infrastructure improvements, young driver education and distracted driving. Arapahoe County has been tracking detailed traffic crash information including fatalities since 2003. Within the County, the overall number of serious injury crashes has decreased in each of the last three years from 390 in 2013 to 300 in 2015. However, the number of fatalities has increased in the same time period from 21 in 2013 to 25 in 2015. CDOT’s Moving Toward Zero Deaths initiative began in 2015 and set a bold and visionary goal of zero deaths for every individual, family and community using Colorado’s transportation network. Moving Toward Zero Deaths is a core value of the state’s Strategic Highway Safety Plan, which provides innovative and data-driven approaches to improving highway safety. Learn more about the initiative and review the Safety Plan at https://www.codot.gov/safety. Every year, the organization Colorado Counties recognizes the outstanding contribution by a commissioner to the statewide organization. The award was presented Nov. 29 to Arapahoe County Commissioner Nancy Sharpe and Mesa County Commissioner Rose Pugliese during the CCI Winter Conference in Colorado Springs. Sharpe, who has been active in CCI since she was first elected to the Board of Commissioners in 2011, including serving as chair of the Health and Human Services Steering Committee since 2014, was recognized for her work strengthening programs and services for children and families. Sharpe is serving her second term representing District 2, which includes Centennial, Greenwood Village, a portion of Aurora and unincorporated central Arapahoe County. Prior to serving as commissioner, Sharpe was mayor of Greenwood Village. In addition to her work through CCI, Sharpe serves on the Denver South Economic Development Board and will chair its Transportation Management Association in 2017. She also serves on the Colorado Executive Leadership Council on Child Welfare and is honorary chair of the IBM Smart Cities Taskforce to address homelessness. In July, she was appointed to chair the National Association of Counties’ Human Services and Education Steering Committee, which pursues legislation to address a broad array of programs that support families and strengthen communities throughout the country. In 2014, Sharpe partnered with District Attorney George Brauchler to start Not One More Child in Arapahoe County, a coalition of community partners working together to prevent child abuse and neglect. As commissioner in 2016, Sharpe serves as the county’s financial officer and oversees the Human Resources, Finance and Human Services departments. She served as board chair in 2012 and 2015. She has been recognized regionally and nationally for her leadership roles with the National Association of Counties, Denver Regional Council of Governments and the Metro Area County Commissioners. Rep. Mike Coffman honored John Norris, Arapahoe County Commissioner Nancy Sharpe’s father. Norris, second to the youngest of seven children, grew up on a farm outside of Calhoun Falls, S.C. He graduated high school at age 16 and then headed to the University of South Carolina for college. While he was studying at the university, war broke out in Europe. With a brother already at West Point, Norris decided that service to his county and a career in the military would be his calling. In 1939, after receiving a Congressional appointment, John Norris entered West Point. The Army, at that time, was small with only about 130,000 men. According to historians, this time was the beginning of many changes from the “old Army” to the new. What didn’t change, however, was their precept of Duty, Honor, country. Because the United States was heavily involved in the war, Norris’ West Point class graduated in January of 1943 rather than June. “My father’s military career began when he served in World War II, 102nd Infantry Division. His division entered combat in Europe with the Ninth Army in October of 1944 and was on the Elbe River in Germany when the war ended. He also served in Korea (1962-63) where he commanded the 2/20th Rocket-Howitzer Battalion, 1st Cavalry Division and in Vietnam with the 54th Artillery Group, II Field Force (1967-68) during the Tet Offensive,” said Sharpe. “My father will say that any story about his life would not be complete without talking about his love, my mother, Irene. While he protected and supported our family for many years, she did the same. She raised my sister, brother and me on her own when he was deployed and moved our family more than 10 times adjusting to a new home herself and ensuring that we did the same. Today at 90, she is our father’s primary caregiver and is one of strongest people I know. A Marine Corps combat veteran, Coffman serves on the House Armed Services Committee and House Veteran’s Affairs Committee, where he is the Chairman of the Subcommittee on Oversight and Investigations. He is the only member of Congress to have served in both Iraq Wars. A little more than two years ago, Arapahoe County Colorado began to see a fast uptick in oil and natural gas production. The new horizontal drilling technique combined with the process of hydraulic fracturing, commonly called fracking, opened up sections of the Niobrara Formation located in Arapahoe County. These innovative drilling techniques have made previously unprofitable areas such as the Arapahoe County section of the Niobrara Formation accessible to large producers such as Anadarko, Conoco Phillips and Noble Energy as well as many smaller sized operators. As both a county official and a resident of Arapahoe County, I want to take a moment to address the issue of the balance as it relates to oil and gas development, both in our county and in the state of Colorado. The theme of balance is one that seems to have been embraced by one side in this debate, while largely rejected by the other, leaving the rest of us to deal with the potential fallout of bans on oil and gas production. Centennial – Arapahoe County Commissioner for District 2, Nancy Sharpe will launch her campaign to be re-elected with an event on Tuesday, February 25. The kickoff event will take place at the Tavern DTC from 5:30 to 7:30 pm. Constituents, elected officials, community leaders, and friends supporting Sharpe’s candidacy, will attend to celebrate her vision for another four years of prosperity and safety in Arapahoe County.